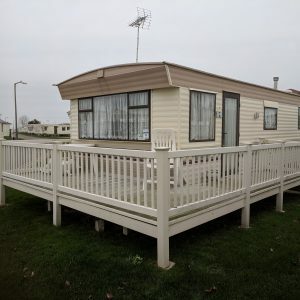 This beautiful Willerby Brockenhurst has been very well loved and is only 1 year old. It also benefits from front opening French doors. The living space is a very generous size, with comfy seating and modern décor, plenty of storage options and feature fireplace with electric flame effect. The living and dining area continue to impress, with table and chairs included and a fully fitted kitchen, lots of work space, storage and integrated appliances. Down the hall you have 3 bedrooms; two twin rooms with single beds, lockers and wardrobes. Then a larger master bedroom with double bed, lockers and wardrobes. Back down the hall you have the main bathroom with large fully enclosed shower, vanity sink and toilet, plus another separate toilet. If you have any questions or would like to view this mobile home, please just give us a call or send a message, have a Sunrise day! Very good condition – just needs a good jetwash!